We all crave a good nosh-session post-gym. But why waste that good workout on a 1200 calorie burger or 500 calorie milkshake? It’s like flushing your progress down the drain! Here's some great ideas for more healthy clean eating snacks after your workout, but to curb your after workout binging, try one of these 8 tasty, energy boosting pre-workout snacks before you hit the gym. No wonder this is a mom’s go-to snack for her kiddos’ lunchboxes. Combining fiber, protein, and healthy carbs, this dynamic duo is a perfect energy pairing. Mix it up with almond butter or bananas for some additional flavor. You can find this protein packed snack in the frozen foods sections and it can be served warm or chilled. Add a sprinkle of ginger or cayenne pepper for a little more pep, or a squeeze of lemon juice for a zesty twist. Almonds are the king of healthy nuts, but his close ranked cousins include hazelnuts, peanuts, chestnuts, and pistachios. For an even lower calorie treat, try seeds like sunflower, chia, pumpkin, or hemp. 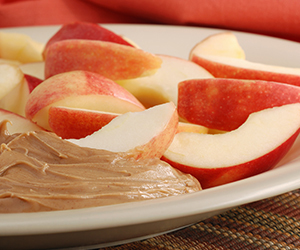 This fiber packed, low-calorie dip is the perfect companion to your seasonal veggies like carrots, cucumbers, zucchini, bell peppers, or broccoli. For a crunchier version, try it with pita chips or whole wheat crackers. Skim Mozzarella is a great, tasty choice packing only 70 calories per ounce. But you can also try sliced Parmesan at only 20 calories per ounce, or for a creamy treat try Feta or Goat both only 75 calories per ounce. A great high protein choice that packs on the protein. Instead of mayo, try mixing with plain greek yogurt and a sprinkle of garlic salt. Spread over celery sticks or stuff tuna mix inside sweet baby peppers. The incredible, edible egg is still a great choice that doesn’t sabotage your diet. Loaded full of good-for-you vitamins and omega fatty acids it’s a smart option for on the go. Sprinkle with salt and pepper for a classic flavor, or break out of the box with paprika or dill flakes. Opt for a Greek yogurt that’s high in flavor and low in fat. Toss in seasonal fruits like berries, peaches, or pineapple. If you prefer a little crunch to your yogurt, add some almonds or pumpkin seeds and dried fruit. Or, to keep it uber simple, stir in honey and you’re done! Whatever you choose, keep your pre-workout snack high in protein, low in fat, with a healthy dose of carbs to keep you going strong from warm up to cool down.